Tony Chu’s talent is also a curse. “Chew” is a unique take on a genre that is prevalent throughout literature and television: the crime procedural. Yet this book has many twists and turns that upends the genre with heaps of hilarity. It has a protagonist that’s unlike any seen in a crime story past or present. Detective Tony Chu is cibopathic, which means when he eats anything (whether it’s food, animal, or human flesh and blood) he can vividly picture everything in his mind that the object went through from birth to present time. When he eats a hamburger, for example, Chu can see the cow being slaughtered. After twenty three million people die in a bird flu pandemic, chicken is outlawed and a vibrant black market is driven underground. When Chu gets involved in a murder investigation, he’s hired by the F.D.A. as an agent in their special crimes division, which wants him to use his special ability to solve crimes. What he doesn’t expect is that he has to consume such objects as rotted human flesh. Chu has interactions with characters that will have the reader giggling and also admiring the detail that writer John Layman and artist Rob Guillory have brought to a genre that they upend with ease, wit, and artistry. 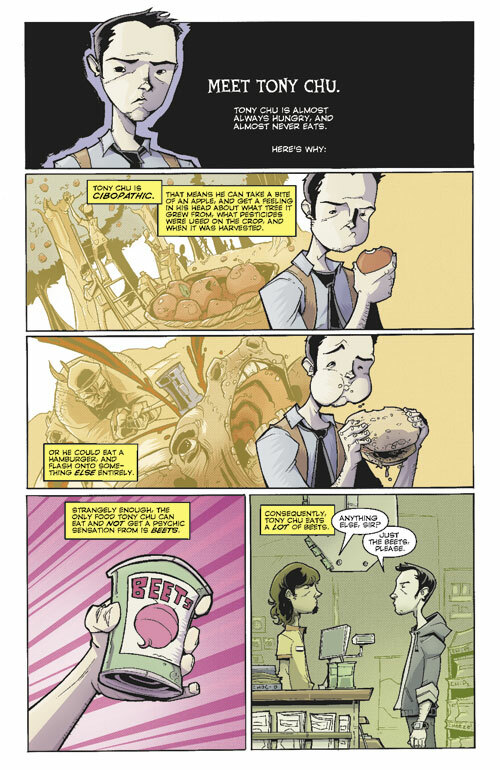 A fast-paced story intermingled with snappy dialogue and unique characters makes “Chew” a book that one will want to continue reading after consuming this delectable first volume. From the very first pages, crime tropes are ingeniously used throughout the book, giving the story an air of a television crime procedural. Tony Chu is first introduced by a third person voice-over telling the reader, “This is Tony Chu. Tony Chu is almost always hungry, and almost never eats. Here’s why…” The voice then goes on to describe his cibopathic abilities. Layman and Guillory add humor to the description when the voice says the only thing Chu can eat without getting “a psychic sensation is beets.” A hand is thrust out in the panel holding a can of beets with purple rays conveying a sense of motion. Characters throughout this collection are introduced in this ingeniously inventive way, including the crime victim Evan Pepper, Agent Mason Savoy, and Amelia Mintz. A five page scene in the second chapter of the story demonstrates just some of the humor that both Layman and Guillory pepper throughout the book. By utilizing humor, they are also able to build character. The scene starts with a shot of a cartoonish-looking fast food restaurant named McBeefy’s Burgers, with a sign below the logo exclaiming “Come Die With Us.” Since Layman also does the lettering in the book, there’s no way of knowing if Layman or Guillory came up with the hilarious signs that pervade this scene and the entire book. Either way, judging by this scene, both excel at humor and make an excellent team. Chu is there to interview an employee named Danny Cornblum who found a decomposing finger between a hamburger bun. Danny refuses to answer any questions, calling the F.D.A. “a bunch of fascists” who concocted the bird flu as a hoax in order to bully the public. The attention to character detail is shown by Guillory’s use of facial expressions on both Chu and Danny, with Danny having his arms folded with shadow covering up his eyes which emotes a sense of anger and defiance. Chu simply grabs his nose in exasperation and sighs. Chu is then distracted by a blond woman eating a burger and the panels featuring her in them suddenly turn a reddish hue. What is assumed to be in his head is expressed in a circle next to the mystery blond woman. In that circle is Chu looking overly smitten and with an exaggerated visage of infatuation. His mouth is in a wide open goofy grin and hearts flutter around him. This part of the scene shows how Guillory is an expert at not only pencilling, but coloring as well. After the distraction of the beautiful blond, the reader then gets to see what kind of character Tony Chu is and the lengths he will go to in order to get to the truth. Chu pretends to call a hit on Danny’s family, with Agent Savoy actually being on the other line. Chu lies and says, “Request strike team sent to residence for elimination of agitator.” Danny’s face slowly turns to one of fear and he begins to scramble over the counter, saying he’ll tell Chu everything. This crime fighter will do anything, including lie, to get to the bottom of a mystery. Then, in one hilarious burst of dialogue in one humongous and wordy dialogue balloon, Danny admits to stealing from the cash register so his friends could buy beer and weed. He also admits to other indiscretions and even blurts out the indiscretions of others. The look on Danny’s face after his confessions is now one of defeat and despair, with the comical detail of one long teardrop coming from his left eye matching the drip of green snot coming from his left nostril. Through that expertly written and drawn comical confrontation, Chu eventually gets somewhere in his investigation. One way to get a confession out of someone! Character, as evidenced in the scene with Danny and Chu, is very important to the story. The way they intersperse characters that become important later on keeps the story on its feet and also adds to the mystery element of the proceedings. 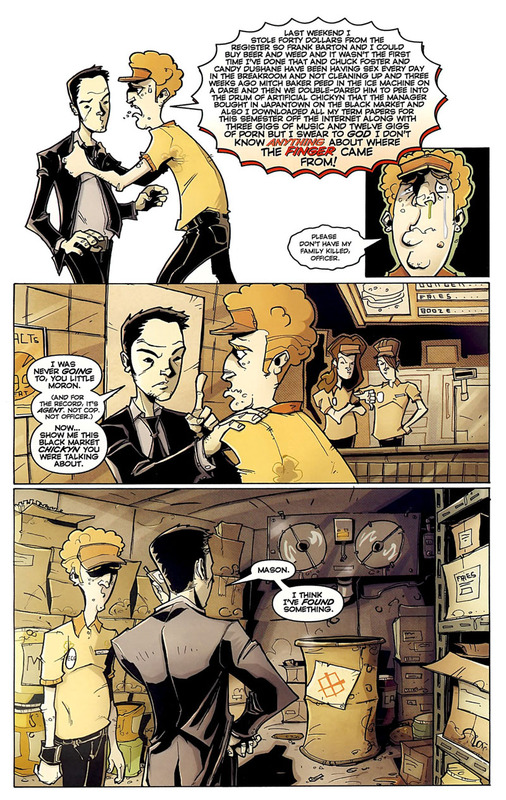 A relationship that is bound to grow in the next volumes of “Chew” is the one between Chu and the blond encountered in McBeefy’s Burgers. Her name is Amelia Mintz and she’s a food critic and saboscrivner. This means that because she can write so accurately about food, “people get the actual sensation of taste when reading about the meals she writes about.” Before we even find out about this in the introductory third person narration, the previous pages show the people of Philadelphia going about their day. They read the newspaper and, when they reach Amelia’s column, hilarity (or grossness to the weak-stomached) ensues, with people vomiting up green puke everywhere because of a bad review of a restaurant. Amelia walks among the populace, who are in pain on the floor, with a grin on her face and a tune on her lips. She’s proud that she has the power to influence people in this strange way. When she looks up at the bright sun shining upon the newspaper building, the reader knows it’s Amelia. This scene demonstrates story and characterization can be conveyed through art alone or through a combination of Layman’s elaborate use of phrasing (as with Agent Savoy’s flowery language) and Guillory’s art. Mystery and intrigue permeates the book, with characters appearing and then disappearing without any explanation of why they are no longer in the story. People appear, like Tony Chu’s brother Chow Chu and Amelia, and then are whisked away without any explanation. Layman and Guillory are building a world with characters that will have much larger roles to play down the road of the book’s run. This is a long-form detective yarn that is obviously being mapped out by Layman and Guillory. The reader is thrown for a loop toward the end when the book takes left turns into other genres that they would never expect to occur in a crime drama. “Chew” is definitely a uniquely exciting crime comedy, with the first volume ending with a dash of underlying alien and vampire intrigue thrown into the mix. What makes the book’s premise so unique is that the reader never knows what’s coming next, with hilarity added to character and story. Tony Chu is a man with integrity who has a need for order and transparency, yet is surrounded by people who have hidden agendas and lives that aren’t fully revealed to him or the world. “Chew” is a book that can be read multiple times and enjoyed because of the pure imagination that is distilled within its pages. Nothing is like it out on the comic stands, yet it has a welcome familiarity because of Layman and Guillory’s expert use of character, dialogue, and artistry in every sense of the word. The first volume of “Chew” gives the reader a lot to chew on and will make the reader hungry to read the next installments of such a savory feast of a book.